Expected to be either an IBM Customer or Business Partner attending the IBM Skills Academy, or a nominated Information Technology professional working for IBM. Completion of Module I - Analytics Overview: Covering Business Analytics Overview, Trends, Case Studies; and Understanding Business Intelligence and Analytics. Completion of Module II - Business Analytics Foundations: Covering Introduction to Data Mining CRISP-DM. Completion of Module III - Predictive Analytics Modeler: Covering Nodes and streams; Initial data mining, storage and field measurement; Understanding the data; Integrating data; Deriving and reclassifying fields (CLEM); Looking for relationships (matrix, distribution, means, etc); Functions (conversion, string, and statistical); Data transformation; Statistical, graphical and sample nodes; Automated data mining and modeling; and Predictive models and customer segmentation. 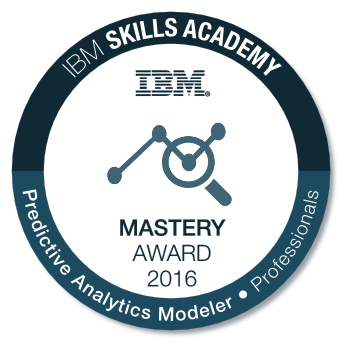 Passing the IBM Proctored Exam for "IBM Predictive Analytics Modeler 2016". Receiving the Explorer Award for Professionals 2016.